T T he bottom tier of the in-flight snack hierarchy is constructed from tiny bags of stale peanuts and pretzels. The top? A twin pack of Biscoff cookies. The obscure Belgian cookie took its first steps stateside in the mid-'80s, but that wouldn't have happened without Delta Air Lines. The company was the first to popularize the cookie and now hands out almost 80 million packages of the buttery, crumbly, warmly spiced cookies each year. Over the past 30 or so years, the shortcrust cookies have been served as the on-board snack of many domestic airlines and a few international carriers. Biscoff is now also available all over the country in grocery stores and as "cookie butter," a magical spread made from the cookies. But it hasn't always been so easy for Americans to get their hands on the now-beloved cookie. Known in Europe as Lotus Speculoos, the cookie was invented in Belgium in 1932. And since then, every single Biscoff cookie has been baked there, according to the exact same recipe. 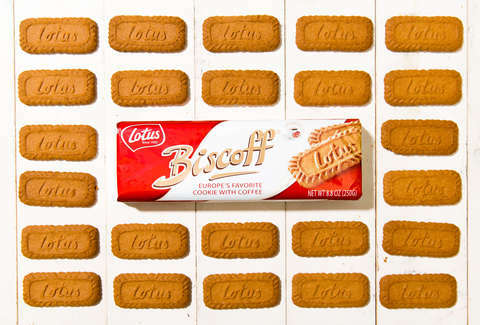 (Though, in 2019, Biscoff's parent company, Lotus, will open a bakery in North Carolina and make the cookie outside of Belgium for the first time.) The spiced cookie rocketed to popularity in Europe after being served at the 1958 World's Fair in Belgium, but didn't make the leap across the pond until nearly three decades later in 1986. And when it did, the cookie took on a new name for North America. 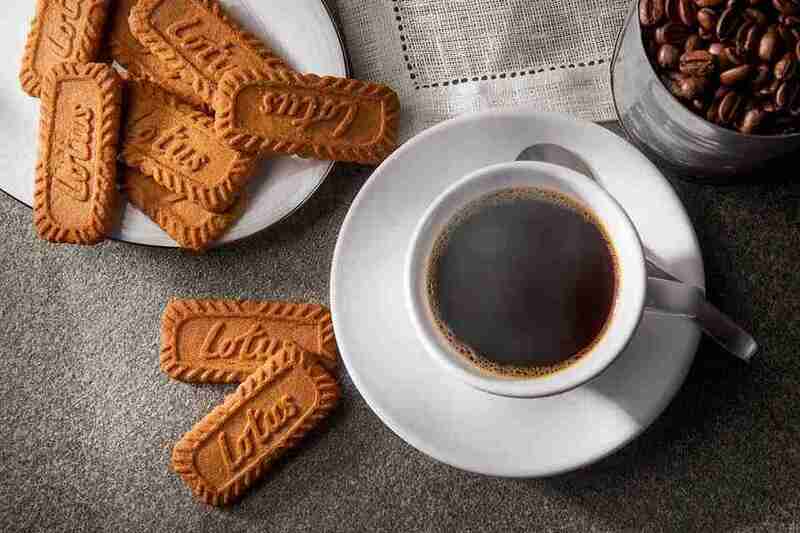 Lotus Speculoos became "Biscoff," a portmanteau of the words "biscuit" and "coffee" meant to show what this cookie did best: pair with a cup of joe. America can thank Michael McGuire, a US-based food broker, for the first introduction to Biscoff cookies. While traveling in Europe, McGuire tasted the cookie and liked it so much he brought it back to the US and showed it to Delta. The airline realized it had a genius cookie on its hands, snapped it up, and began serving it in-flight around 1985 (there is also an alternate -- though less fun -- version of the story, in which McGuire found Biscoff at the Fancy Food Show in San Francisco). At that point, the only way to get a Biscoff cookie in the US was to book a seat on a Delta flight. "Biscoff," a portmanteau of the words "biscuit" and "coffee" meant to show what this cookie did best: pair with a cup of joe. The decision to stock the cookie was a total hit. "It leapfrogs anything we've ever served on board," says Dan Mord, general manager of domestic product design for Delta. With their many years in the in-flight food space, neither he nor his colleagues are aware of any other success of the same magnitude. "It has become an iconic part of the Delta brand itself." 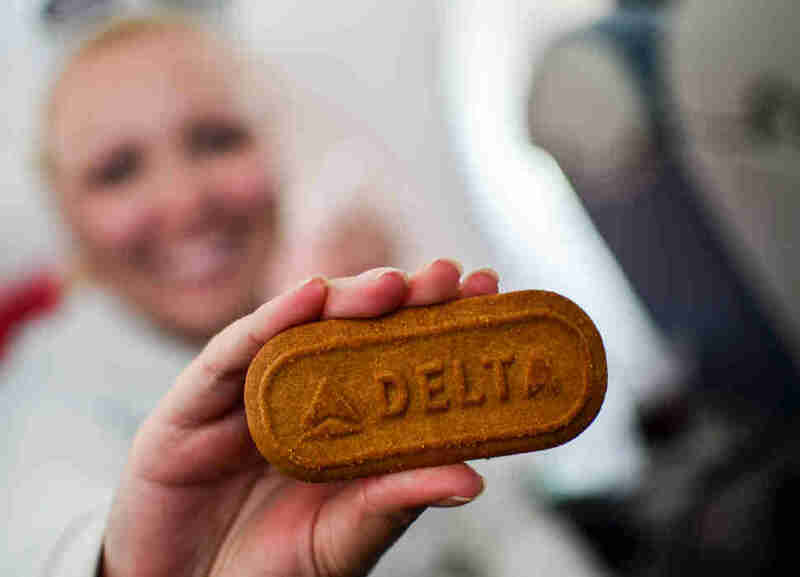 The airline has made some tweaks to the cookie, though: In the late 1980s the airline served the same .22oz single cookie found in Europe, but in true American fashion, Delta now serves a bigger .9oz double pack of Biscoff, each cookie emblazoned with Delta's name. Customers, smitten with the gingerbready treat, deluged Delta headquarters with calls in an effort to stock up on their own supply. Others mailed letters to the cookie company using just what was listed: the city and ZIP code (which, surprisingly, the post office did forward to the company). The most successful fans called Information and paid for a long-distance call (remember those?) to the cookie's distributor, Gourmet Center, to find out how to purchase the cookies, says Gary Payne, the former general manager at Corona-Lotus (the company's American arm). Lotus would have the Delta passengers looking to buy cookies send a letter and a check to the American office. Each day at lunch, the workers would gather around and read the "Biscoff letters," then type a few address labels and Payne would drop the cookies at UPS on his way home. This eventually turned into a mail-order catalog business, then an online-ordering business, before Biscoff hit retail stores about a decade ago. In 2010, food writer and cookbook editor Francis Lam wrote for Salon about his inclination to choose Delta over other carriers because of the cookies. He described them as tasting "beautifully and comfortingly of warm spices, caramel, and wheat," and tipped the world off to a broke flight attendant's culinary secret: Taking a lime from the beverage cart and squeezing it over the top of the Biscoff makes a dead-ringer for the flavor of Key lime pie. It has become an iconic part of the Delta brand itself. But Payne's favorite story is that of Three Pointed Star, a race horse whose owner slipped her airplane treat into her pocket for later, only to have it discovered by the thoroughbred just before its race. She offered the horse the cookie, and, Payne says, "you probably guessed by now," that Three Pointed Star won that day -- and Biscoff got credit. For several years, whenever he would race, his trainer would call for a rush shipment. "We must have sent Biscoff to nearly every racetrack in the country." This craze for Biscoff only heightened with the invention of something fondly known as "cookie butter." The winner of a television cooking contest in Belgium first developed it around 2010. Turning the cookie into a spread won her the contest -- and the chance to collaborate with Lotus on the eventual commercial product, which shot to fame. Lotus makes its own version but a number of companies have also hopped on the cookie butter train: The spread is a big seller for Trader Joe's (which also offers crunchy and cocoa swirl versions). 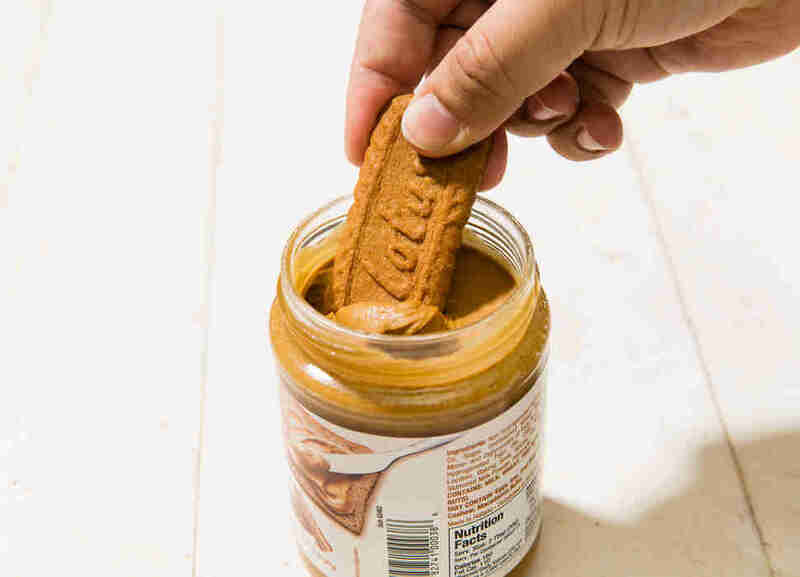 Hailed as the "new Nutella," cookie butter has worked its way into practically everything from donuts to the pastry case at Starbucks. Blogger and expert on in-flight food Nik Loukas of Inflight Feed can't think of any other foods that have had quite this type of special crossover, starting in-flight and moving to retail success. "I don't think anything else comes close to it." He notes that there are some flavors that have been shown to work better in the air -- tomato juice, he mentions -- that people either don't like on the ground or simply like more in the air because of how taste buds are affected by altitude. But, he says, he's not sure that's the case with Biscoff: It's just a seriously good cookie. Even with all of the fervor surrounding the cookie, Lotus has always had something of a passive strategy when it comes to the American market. It took an American coming over to discover the cookies, overwhelming phone calls and letters to get the company to sell them by mail, and then, only after years of inquiries from retailers who had tasted the cookies on planes, did it finally start selling them in store. Both Payne and Mord have a treasure trove of anecdotes about how beloved the cookie is. There was the couple who met as seatmates on an airplane: The woman remarked how much she liked the Biscoff cookie. The next day, he called the company to send her a box, leading to a tradition of sending each other Biscoff, and eventually, a wedding with Biscoff cookies on the menu. And there was the call from a grandmother who let temptation get the best of her and ate her sleeping grandson's cookie during the flight. "Her conscience got the better of her," Payne says, "and she ordered a box to be sent to him." Cookie butter has worked its way into practically everything from donuts to the pastry case at Starbucks. In December 2016, Delta changed its snack options for the first time in more than two decades. The airline upgraded its peanuts and pretzels to new brands and bigger packages, and added granola bars to the mix. Delta plans to rotate its snacks out every six months. Well, all but one: the Biscoff cookies. Those are most definitely not going anywhere. "It's important to customer satisfaction," says Mord. Naomi Tomky is a freelance food and travel writer who, as a frequent flyer, cares deeply about her airplane snacks. Follow her edible adventures on Twitter @Gastrognome and on Instagram @the_gastrognome.